January 3, 2015 is the first day in the new year for me to complete a small painting. Having finished a large painting from a photograph a few days earlier, I wanted to paint from life today. It's my preferred way to paint, but it was rainy and cold outside Since that wasn't going to work, I painted from a vase of flowers in my studio. I chose a small square canvas because I knew I wouldn't have a lot of time to paint and I enjoy painting the square canvas. On a white canvas, I loosely scrubbed in the middle values of the flowers, finding the location and a very general shape for each cluster of flowers. There was no detail but only an abstract design. With the dark background color, I found the edges of the flowers. 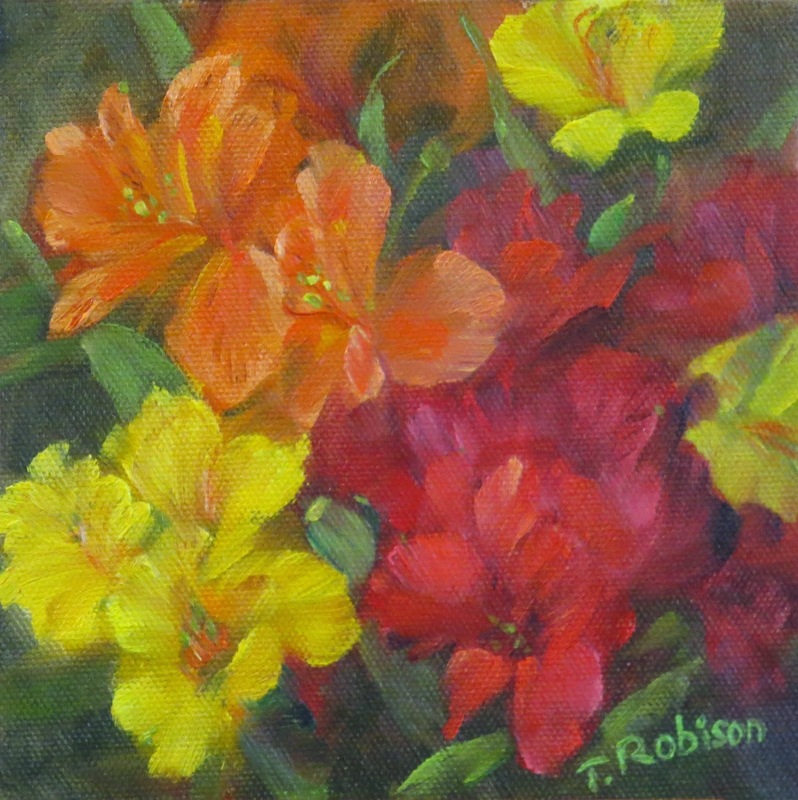 The shadow in and around the flowers was painted next and the flowers seemed to emerge from the canvas. The last thing added was white to the flower and leaf colors to paint the lighter areas and highlights. By following this order of events and saving the addition of white until last, I can keep my darks dark and my bright colors bright.